I have a lead on a boy puppy if anyone is thinking about that this fall, or, if you know of someone who would be interested. Meanwhile, Happy Labor Day weekend! We are now looking for a retirement home for Ronnie. OK, what’s retirement? When a dog is finished with their “career” multiple dog owners will sometimes look for a place where an adult can kick back and be an only dog or maybe one of two dogs. I confess that I am a *slight* Airedale hoarder! 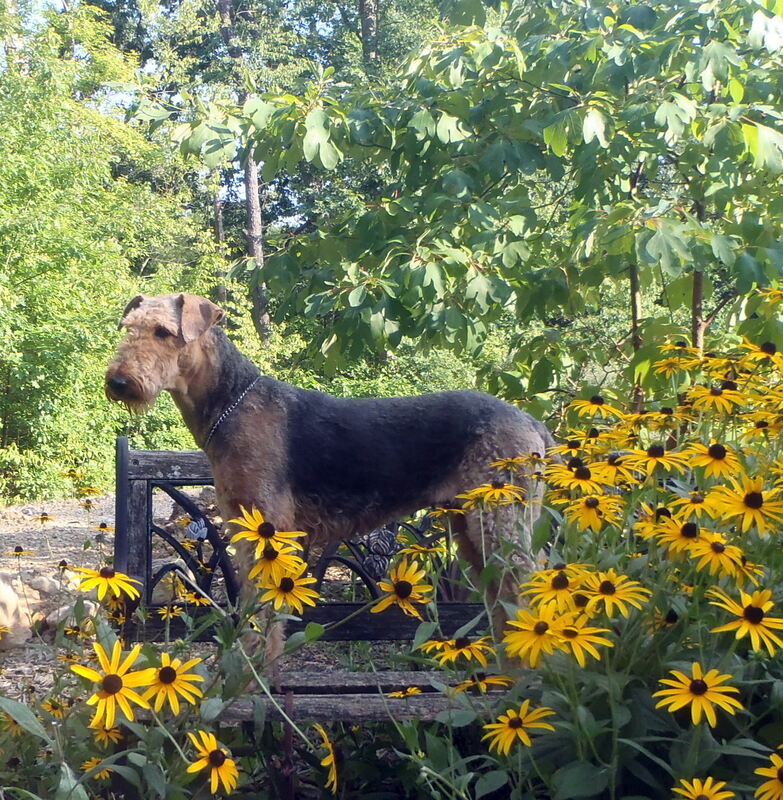 We are home here to several Airedales and I think Ronnie would get lots more attention by locating someone that wants just her. Personality: Very affectionate and even wants to trip you by staying too close–this could be annoying or endearing, depending on what you think of it! Walks gently on lead without pulling. 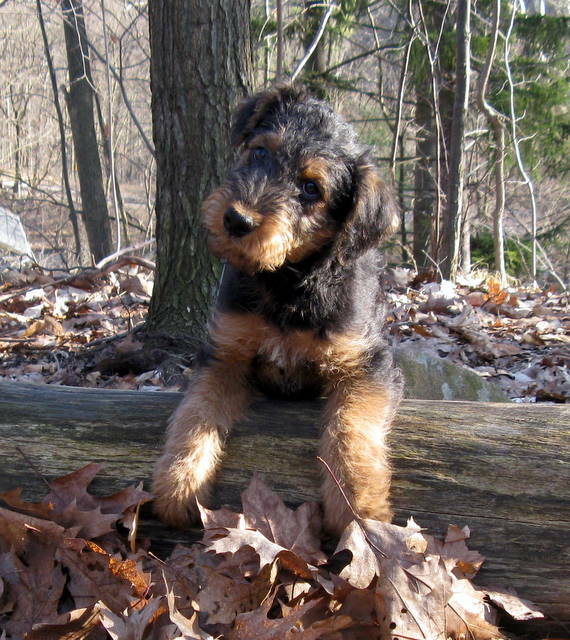 Enjoys good appetite and eats neatly but water drips from beard (it’s an Airedale thing). LOVES rubs behind the ear. Enjoys other dogs if they aren’t too rough in playing; doesn’t like other dominant females. Trained to be crated while you are away and I would recommend that to be safe with miscommunication about when she needs to go out. Tends to freak out with loud noisy environment–rowdy parties, new loud people, construction/remodeling in the house, stuff like that. Fall back retirement job: She might be a wonderful therapy dog as she is SO gentle. Where’s she been for the last year or so? 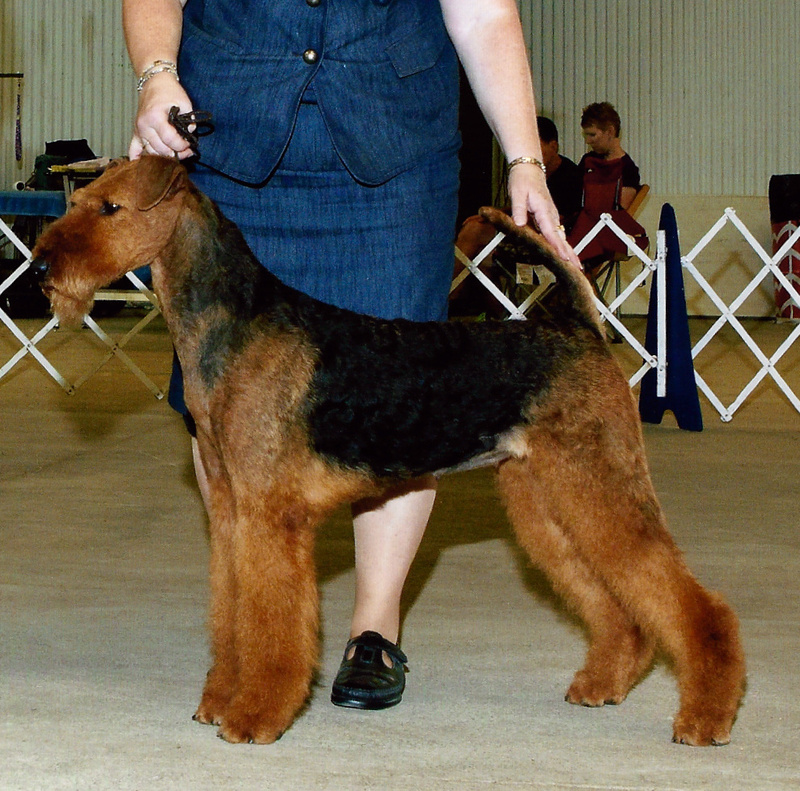 My son, Tim, grew up with the Airedales, naturally. He bought a new house and wanted to work with an Airedale for the first time on his own. Now his work schedule has changed and he can’t be home enough to take care of her. So Mom is looking for a permanent place for our girl Ronnie. Price: Like the commercial says, priceless…..to the right person who can love her like she deserves. Ikarus von Garnsee and Ronnie (Seneca Deutsch Schokolade). I really miss her and want her home!